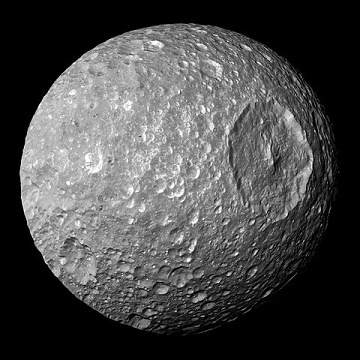 C’est Mimas, une des lunes de Saturne ! • The construction of the Death Star has been estimated to cost more than $850,000,000,000,000,000 . We’re working hard to reduce the deficit, not expand it. • Why would we spend countless taxpayer dollars on a Death Star with a fundamental flaw that can be exploited by a one-man starship ? However, look carefully (here’s how) and you’ll notice something already floating in the sky — that’s no Moon, it’s a Space Station ! Yes, we already have a giant, football field-sized International Space Station in orbit around the Earth that’s helping us learn how humans can live and thrive in space for long durations. The Space Station has six astronauts - American, Russian, and Canadian - living in it right now, conducting research, learning how to live and work in space over long periods of time, routinely welcoming visiting spacecraft and repairing onboard garbage mashers, etc. We’ve also got two robot science labs - one wielding a laser  - roving around Mars, looking at whether life ever existed on the Red Planet. Keep in mind, space is no longer just government-only. Private American companies, through NASA’s Commercial Crew and Cargo Program Office (C3PO) , are ferrying cargo - and soon, crew - to space for NASA, and are pursuing human missions to the Moon this decade. Even though the United States doesn’t have anything that can do the Kessel Run in less than 12 parsecs, we’ve got two spacecraft leaving the Solar System  and we’re building a probe that will fly to the exterior layers of the Sun . We are discovering hundreds of new planets in other star systems and building a much more powerful successor to the Hubble Space Telescope that will see back to the early days of the universe . We don’t have a Death Star, but we do have floating robot assistants on the Space Station , a President who knows his way around a light saber  and advanced (marshmallow) cannon , and the Defense Advanced Research Projects Agency, which is supporting research on building Luke’s arm, floating droids, and quadruped walkers. We are living in the future ! Enjoy it. Or better yet, help build it by pursuing a career in a science, technology, engineering or math-related field. The President has held the first-ever White House science fairs and Astronomy Night on the South Lawn because he knows these domains are critical to our country’s future, and to ensuring the United States continues leading the world in doing big things. We the People est une référence aux premiers mots de la Déclaration d’indépendance. Une ale est un type de bière. Ale to the Chief est aussi un clin d’œil à la musique Hail to the Chief.